Apollo Voices has swiftly built an enviable reputation as one of London's most versatile choirs. Performing in public concerts, radio and TV broadcasts, CD recordings, and film soundtracks, their repertoire has covered the gamut of composers and styles and taken them to most of the UK's major concert halls, cathedrals and recording venues. The singers are handpicked according to the repertoire and have often featured in Apollo Voices projects as step-out soloists to great acclaim. Apollo Voices' London debut was made at the Royal Festival Hall with the BBC Symphony Orchestra, conducted by Sir Andrew Davis, in a concert performance of Zemlinsky's Es war Einmal and the choir was to return there for the London premiere of Birtwistle's extraordinary The Second Mrs Kong in a semi-staged performance, conducted by Martyn Brabbins. On both occasions the choir provided many of the smaller solo roles. Apollo Voices has also made regular concert appearances at the Barbican – Shostakovich's Odna (UK premiere), Osvaldo Golijov's Ainadamar Arias and Ensembles (world premiere) – and the Royal Albert Hall – three performances in the BBC Henry Wood Proms, Kurt Weill's Royal Palace, with Sir Andrew Davis, Rimsky-Korsakov's Mlada, under the baton of Valery Gergiev and Schubert’s Ständchen with Markus Stenz and the Gürzenich Orchestra. In addition to its classical work, Apollo Voices has appeared in celebrity concerts with Bernard Cribbins, Video Games Live at The Apollo Theatre, Hammersmith and corporate events in and around London. It has also provided a quartet of vocalists for Russell Watson in a sell-out UK tour and Christmas concert in Kuala Lumpur. Apollo Voices' discography continues to grow. From Chausson’s Le Roi Arthus (Telarc International) and the recording of Joseph Marx’s Choral works with the BBC Symphony Orchestra (Chandos Records), where many small roles and solos were cast from within the choir, the group has had success as part of the live recording of Wagner’s Tristan und Isolde at The Barbican (Warner Classics) and now begun to build its reputation in the studio, recording backing tracks for such diverse artists as Laura Wright, Patrick Wolf and Noah Stewart. 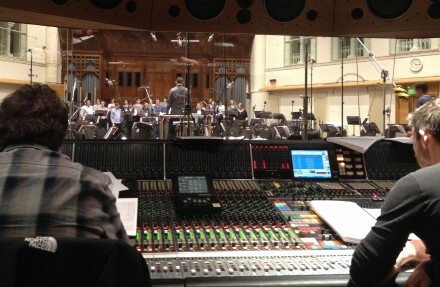 Recording soundtracks for films is now an important part of the choir’s life and subsequent to working on Kenneth Branagh’s interpretation of Mozart’s The Magic Flute (James Conlon conducting The Chamber Orchestra of Europe), Apollo Voices has formed a highly enjoyable relationship with the composer Harry Gregson-Williams, recording several of his film scores, including Shrek Forever After, Arthur Christmas and (in conjunction with composer Marc Streitenfeld) Ridley Scott’s long awaited Prometheus.